Despite being a member of the Royal Institute of Painters in Water Colours and of the British Society of Poster Designers, Kenneth Denton Shoesmith (1890 - 1939) is little known today, yet his maritime art perfectly captures the romance and adventure of ocean liner travel in the early 20th century. In 1918 he left a career at sea to devote himself to painting, and much of his art celebrates the ships of the Royal Mail Line, for whom he produced a vast amount of paintings and sketches for advertising purposes, but perhaps the pinnacle of his career was working on the interiors of Queen Mary. Shoesmith died at the early age of 48 just before the outbreak of war in 1939. An obituarist wrote: 'As a poster artist - he was quite definitely in the front rank of those who are content to paint what they see and know. He was direct in his methods, sound in his drawing and brilliant in his colour. His ships were not only correct in detail but they were always in and not on the water, for he painted with a seaman's knowledge as well as an artist's perception.' Glyn Evans has spent many years researching this elusive artist and rediscovering his works to share with a wider public. The selection of works included here are a fond tribute to Shoesmith's talent, and an expression of the author's personal delight in having discovered a maritime artist so gifted in the skill of bringing ships to life and imbuing them with such character as to make one wish to rush out and book passage on the next available sailing! Glyn L. Evans was born in Birkenhead in 1944 and spent much of his childhood around the docks and waterfront of the River Mersey, fascinated by the comings and goings of the big ships and the fussy little tugs that danced attendance on them. On joining the Sea Scouts (64th Birkenhead) he had the opportunity to see the giant boats in close-up. At their boat-station on the West Float, the Sea Scouts kept a few dinghies and many a happy hour was spent rowing in the shadows of the steel hulls towering above. The major ship-owners using Birkenhead docks at that time included Blue Funnel, Bibby, Anchor and Clan Line, while other vessels discharged grain for the major flour millers, molasses for United Molasses and iron ore at Bidston Dock for John Summers Steelworks at Shotton. The ships' names read like a history and geography lesson rolled into one, Prometheus and Ajax, Oxfordshire and Staffordshire, Clan Graham and King Charles, Caledonia and Circassia, to name but a few. Further inspiration came later from the hobbies of ship photography and ship postcard collecting, 12 years of commuting on the Mersey Ferry between Birkenhead and Liverpool, plus 40 years in the marine insurance market. Glyn's series of paintings 'Funnel Vision' has been exhibited at the National Waterways Museum, Ellesmere Port, and Gloucester Docks. 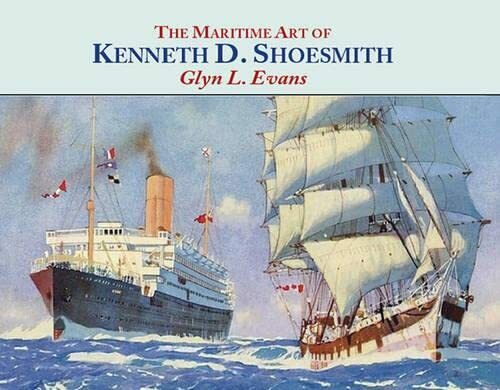 Little wonder then that he should recognise, in Kenneth D Shoesmith, the works of a great maritime artist.